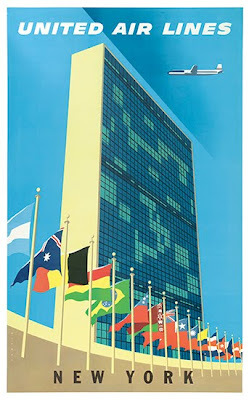 We will be featuring some rare vintage travel posters dating back to the period between the 1920's and 1980's. Most of them are stunning examples of beautiful graphic design. This poster will be up for auction at "rare and important travel posters" auction at Swann Auction Galleries in New York City on November 18th. One in a series of posters Binder designed for United Airlines (others include Washington and New England). Joseph Binder emigrated from Austria to America in the mid-1930s. He had studied at the Vienna School of Applied Arts under the great Secessionist Alfred Roller, and became one of the most promising modernist graphic designers in Austria. He continued working as a graphic designer in America. In addition to United Airlines he also worked for the American Red Cross. He designed covers for Fortune and Graphis magazines and, in 1948, was appointed art director and designer for the U.S. Navy. Binder p. 110 (var).